In the course of their research, Lederberg and Tatum studied strains of E. coli possessing auxotrophic mutations. 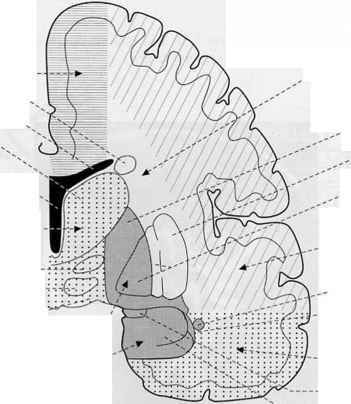 The Y10 strain required the amino acids threonine (and genotypically was ttr~) and leucine (leu~) and the vitamin thiamine (thi~) for growth but did not require the vitamin biotin (bio+) or the amino acids phenylalanine (phe+) and cysteine (cys+); the genotype of this strain can be written as: thr~ leiT thi~ bio+ phe+ cys+. 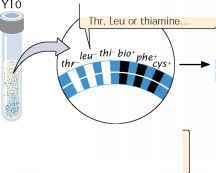 The Y24 strain required biotin, phenylalanine, and cysteine in its medium, but it did not require threonine, leucine, or thiamine; its genotype was: thr+ leu+ thi+ bio~ phe~ cys~. In one experiment, Lederberg and Tatum mixed Y10 and Y24 bacteria together and plated them on minimal medium ( FIGURE 8.10). Each strain was also plated separately on minimal medium. Question: Do bacteria exchange genetic information? ft .. .and so neither auxotrophic strain can grow on minimal medium.